So let’s talk about that 10GbE switch I bought on eBay. First, loud is too soft a word to describe this. It has two 1U power supplies and three 40mm fans. The pair of PSUs is for redundancy, so you can cut some of the noise by having only one plugged in. But given how loud they already are, the second power supply isn’t going to increase the noise output much. You can probably tell from the picture that I have this sitting on something. It’s a folded up length of fabric my wife got a while back that she never used, so I’m using it as an anti-vibration rest. It helped cut the noise a bit as well. The 40mm fans are, specifically AVC DB04028B12U. They are 4-pin PWM fans rated at 55dB/A and a massive 21 CFM (about 36 m³/h). Three of them are equivalent to shy of 60dB/A at full speed. They are PWM controlled, but even at the slow speed they were running, it was still way too loud. And there was a very noticeable, tinnitus-inducing high pitch to the fans as well given their small size. Are these fans really necessary, though, or could they be swapped out for much quieter fans – ones that, unfortunately, have less than half, if not less than 1/3rd the air flow – without risking overheating the switch? From what I can find online, it appears the fans can be swapped out without much risk. Provided the switch isn’t under a substantial load. The fans are mounted to an easily-removed tray, so no major surgery to get to them. But 40mm fans tend to be poor on airflow. Certainly nowhere near the jet engines that come with this. 21 CFM is what you’d expect from 60mm or 80mm fans, not 40mm. Most 40mm fans won’t even give 10 CFM! Since I have only four systems connected to the switch, and they will not be under anywhere near a constant 10Gb network load, I’m considering this a risk worth taking. I found a few 40mm fans rated at about 20dB/A and a little over 6 CFM from Micro Center to try first. Plus the switch arrived on a Friday, so I didn’t have many immediate options for quieting this thing down. But three 20dB/A fans at full speed are still a hell of a lot quieter than even one 55dB/A fan at low speed. Plus it doesn’t have that annoying high pitch due to its lower RPM. For a more long-term solution, I had another idea in mind: a pair of 60mm NoiseBlocker PR-2 fans mounted to the back. How? Using 40mm/60mm fan adapters. And I considered buying 60mm to 80mm adapters as well just to see how far up I could take this. But given how little of a load this switch will endure, I’m questioning if that will be necessary. But that still left the power supplies, which are Delta DPSN-300DB power supplies with a power main connector I’ve never seen before. And I’m not going to attempt a fan swap on those, which would require opening the shell on the units. All too easy to touch the wrong thing and die. As expected, the switch is working better than the custom switch, though I’m not seeing better throughput. But I didn’t expect to see better throughput. Such as with file copies from the NAS to my desktop system. So then why buy the switch if I wasn’t expecting better performance, especially since I knew it was going to be demonstrably louder than my custom solution? For one, it has 24 ports meaning I have a lot of room to maneuver in the future. Currently only 4 of those ports are being used. But that could change later on. 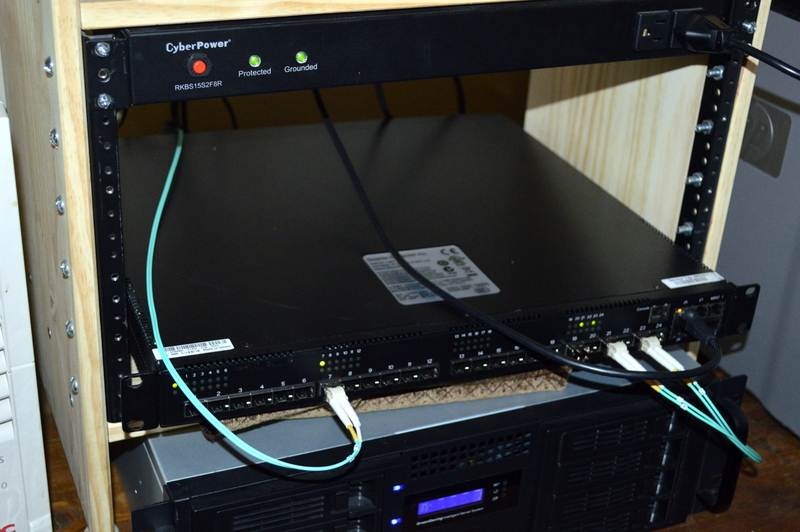 And then there was also the flaky discovery of our Plex DLNA server with the custom switch. At least with Kodi, it was flaky. Indeed our phones and tablets had a hard time finding it through our wireless. Windows 10’s built-in DLNA and UPnP discovery was finding it consistently, so perhaps there’s something up with Kodi and how it does UPnP. But this switch completely eliminated that problem. Kodi on my desktop, phone, and tablet consistently discovers the DLNA server. The flakiness is gone. In Linux there are likely some networking settings I needed to tweak so Kodi could consistently discover the Plex DLNA server. But I’m past that now. I didn’t take on this project to become a networking guru. Which means, as you can probably guess, I’m also not using any of the management options this switch provides. Since I don’t need them. I just needed a 10GbE switch. The only thing that’s really left is seeing what I can do to quiet this thing down more. And it seems my only option is a sound-proof cabinet. Which those aren’t cheap by any stretch. I found a 12U cabinet through StarTech.com that runs about 1,200 USD on Amazon. And that seems to be about the lowest cost on cabinets like this. And the cost of rack cabinets in general is largely why I’ve typically taken to building them instead. I have 12U rails from when I intended to build a 12U cabinet, back when I was considering turning my desktop system into a rack-mounted, water-cooled system. So I’m likely going to look at another DIY option. The available cabinets imply that such a venture should be relatively straightforward, and I already have a couple design points in mind. I know, that sounds a little hypocritical coming from someone who, in the previous section, said to always lean toward off-the-shelf options. But I did also say to do so if it’s at a price point you’re willing to accept. And 1200 USD isn’t a price point I’m willing to accept for a rack cabinet. Not even 1000 USD. Not when I know I can build it for far less.